Rice is the dominant staple food in Asia. About 175 species of insect feed on rice only 20 are considering as major pests including Brown Planthopper (BPH). The Brown Planthopper (BPH) Nilaparvata lugens (Stål) has become a number one threat to tropical rice production in many parts of Asia in the last three decades (Dale, 1994). It infests and kills the rice plants at all stage of plant growth by feeding intensively on them and also transmits grassy stunt and ragged stunt virus diseases (Reissig et al., 1986). For many decades, insecticides have been widely used to control BPH all over the world as well as in Bangladesh. But insecticides are not so much effective to control N. lugens because they aggregate at the base of the rice plants. Besides this, application of insecticides is not effective in all cases due to presence of several overlapping stages. However, the continuous use of a wide range of insecticides cause loss of biodiversity, secondary pest outbreak, insecticide resistance, residual toxicity, the resurgence of insect pest and environmental pollution. It is now widely accepted that indigenous enemies in Asian rice areas are the key to BPH management. In most cases, the numerous predators, egg and nymphal parasitoids, pathogens and nematodes can maintain BPH populations below damaging densities (Kenmore et al., 1984). Host plant resistance was widely developed, with the aim of reducing resurgence of BPH populations, but has been successful only to the extent that new varieties have been continuously introduced. This is because host plant resistance breaks down due to the high selection for viruliferous strains of BPH. Breakdown happens more quickly when pesticide applications continue at high levels (Gallagher et al., 1994). In insecticide-free rice crop in the Philippines Kenmore et al. (1984) observed a positive correlation between spider population growth and BPH availability, and a consequence negative correlation between BPH nymph survival and spider densities. In the 1980s, it was recognized that the over-use of insecticides was the root cause of outbreaks. Biological control, complemented by host plant resistance, is now seen as the basis of management of BPH (Way & Heong, 1994). IPM programmes emphasize that the routine use of insecticides should be avoided (Gallagher et al., 1994; Matteson et al., 1994). Wide-scale observations of low populations of BPH in farmers’ fields, even with BPH-susceptible rice, suggest that more emphasis be put on biological control (Way & Heong, 1994; Schoenly et al., 1996). The dominant predators in irrigated rice during the first 35 days after transplanting (DAT) are the lycosid, Pardosa pseudoannulata and the linyphiid, Atypena formosana (Sahu et al., 1996; Sigsgaard et al., 1999). Both spiders are considered important predators of BPH (Barrion et al., 1994; Ooi & Shepard, 1994; Inthavong et al., 1998; Sigsgaard & Villareal, 1999, Sigsgaard, 2007). Both occur throughout the year (Barrion & Litsinger, 1984; Shepard et al., 1987; Rubia et al., 1990), and their field densities co-vary with hopper densities (Reddy & Heong, 1991). Later in the cropping season, predatory bugs become the dominant predators. One of these is Cyrtorhinus lividipennis, an important predator of BPH eggs and young nymphs (Heong et al., 1991). Cyrthorinus lividipennis numbers in the field are closely linked to BPH populations (Ooi, 1980; Kuno & Dyck, 1985). Egg parasitoid has been reported at significant levels in various rice growing region (Chiu, 1979; Kenmore et al., 1984; Fowler et al., 1991). 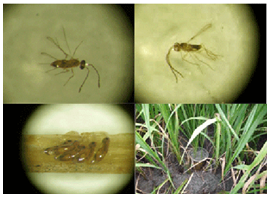 Claridge et al, (1999) monitoring the field parasitism of BPH eggs by wasp of the genera Anagrus (Mymaridae) and Oligosita (Trichogrammatidae) over 6-year period and their technique was to place rice plants previously infested with BPH eggs in the field for 5 days. Their result show that eggs parasitism varied between 29% to 91%. Mortality of BPH eggs in plant collected in field in the Philippines varied between 21 and 42% (Kenmore et al., 1984) and in Sri Lanka egg parasitism varying from 0% to 54% (Flower et al., 1991). Technique of field cage exclusion/inclusion experiment parasitoid demonstrated the significant of egg parasitism in overall BPH mortality (Claridge et al., 2002). So that egg parasitism has the potential to play an important role in the control of BPH population. Several studies show positive effects on biocontrol with increased predator biodiversity (Cardinale et al., 2003; Snyder et al., 2006). To know the nature of damage of rice brown planthopper (BPH). To know the management techniques developed against BPH with different biological control agent. This seminar paper is exclusively a review paper, so the information on “Research Findings on Biological Control of BPH in major Rice growing Countries of Asia” have been collected from secondary sources. With a view to writing this paper I went through different books, booklets, journals, newsletter, proceedings, periodicals, annual reports and website that are available in the different libraries including Bangabandhu Sheikh Mujibur Rahman Agricultural University (BSMRAU), Salna, Gazipur, Bangladesh Agricultural Research Institute (BARI), Joydebpur, Gazipur, Bangladesh Rice Research Institute (BRRI), Joydebpur, Gazipur and personal contact with the honorable major professor and course instructors related to this topic. After collection all the available information I myself compiled those information’s and prepared this paper. 2003). Adult N. lugens are dimorphic, with winged (macropterous) and short-winged (brachypterous) forms. Macropters migrate into rice fields shortly after transplanting. The subsequent generation consists primarily of brachypterous females and macropterous males. Later development of macropterous females can be stimulated by a number of factors, including nymphal crowding, decreasing host-plant quality, short day length and low temperatures (Anon., 2003). The planthoppers attack all plant growth stages but the most susceptible stages are from early tillering to flowering or during the first 30 days after seeding until the reproductive stage. Crop loss is usually considerable and complete destruction of crop in severe cases (Dale, 1994)) i.e. the crop loss may be 100%. In field conditions, plants nearing maturity developed hopperburns if infested with about 400-500 BPH nymphs. In the 1970s and 1980s, BPH was considered a threat to rice production in Asia. Brown planthoppers also transmit ragged stunt and grassy stunt viruses. It was recorded that at a population density of more than 400-500 nymphs or 200 adults per plant. planthopper outbreaks in 13 out of 64 districts. The Plant Protection Wing of the Department of Agriculture Extension reported 2500 ha planthopper affected area out of 4.5 million ha of boro rice (Islam and Haque, 2009). Incidence pattern of brown planthopper over the last 25 years during 1981 to 2006 are presented in Fig 3. The highest population was recorded during the 1997 followed by 2004 and 2005. 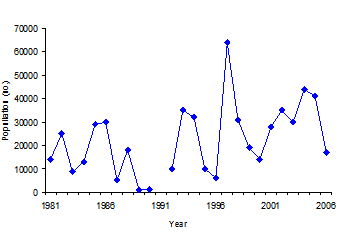 Monthly incidence pattern of BPH at BRRI experimental farm, Gazipur under boro and aman season (data are averages of 10 years light trap catch, 1998-07) shown in Fig 4. Incidence occurs throughout the year but highest incidence observed in April, May and October, November during Boro and aman season respectively (Haque et al., 2011). Biological control usually refers to “the action of parasitoids, predators and pathogens in maintaining another organism’s density at a lower average than would occur in their absence” (DeBach, 1964). Biological control programs have a significant impact on minimizing the adverse effect on insecticides, and in increasing the profitability of rice production. The action of indigenous predator, parasitoid and insect pathogens forms the cornerstone for modern insect management program on rice. 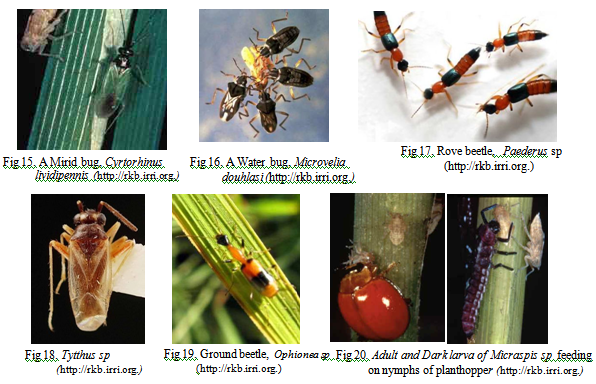 Although 175 of insect species feed on rice only 4% are consider as major pests including BPH. Classical and inundative biological control approaches tried so far had little success in rice. However, research studies have shown that indigenous natural enemies have a strong impact on BPH and their conservation is an essential part of rice research. Many predator, parasitoid and pathogens attack all stage of the BPH. Chiu (1979) recorded 79 species of natural enemies of BPH including 42 species of parasite and pathogen (34 insect, 1 nematode and 7 pathogens) 37 species of predators (21 insect and 16 spiders). Comprehensive reviews of natural enemies of N. lugens are provided by Chiu (1979), Flint and Magor (1982), Greathead (1983), and Ooi and Shepard (1994). Natural enemies of BPH in the Philippines, and the predator complex in Vietnam, are listed by Reissig et al. (1986) and Chau and Mon (1987), respectively. Pathogens are reviewed by Rombach et al. (1994). The some lists are given in Table 1. Table 1b. List of natural enemies (predators) of BPH Contd. Source: Ooi and Shepard (1994), Reissig et al. (1986), Chau and Mon (1987) & Rombach et al. (1994). A parasitoid is an organism living in or on another living organism, obtaining from it part or all of its organic nutrients, resulting in death for the host or altered growth, development and reproduction. Numerous parasitoids have been reported attacking the eggs, nymph and adults of BPH, N. lugens in rice. Egg parasitism has the potential to play an important role in the control of BPH population. At least 19 species of hymenopterous insects (Eulophidae, Mymaridae, and Trichogrammatidae) have been identified as egg parasitoids. Anagrus species had been reported to be a common parasitoid of delphacid eggs in paddy fields. Nueva (1999) studied the egg parasitism estimation of Anagrus spp on BPH in rice field of Philippines. She found that 10 to 70% eggs were parasitizes by Anagrus spp, wasp (Fig 5). Shephard and Rapuses (1994) reported that the major parasitoids of BPH are dryinids and Strepsipterans. This two species parasitized up to 80% in field condition. Afsana (1999) reported that eggs of BPH are parasitized by mymarid, trichogrammatid and eulophid wasps considerably. Yasumatsu et al (1975) reported that four mymarid parasitoids Anugrus optubilis,and Gonatocerus sp (Fig 6) have contributed much to the reduction of the populations of planthoppers and leafhoppers in Thailand. The combined parasitism by elenchids and dryinids (Pseudogonatopus sp. & Pseudogonatopus sp. )(Fig 8, 9) of BPH occasionally reached 40%. 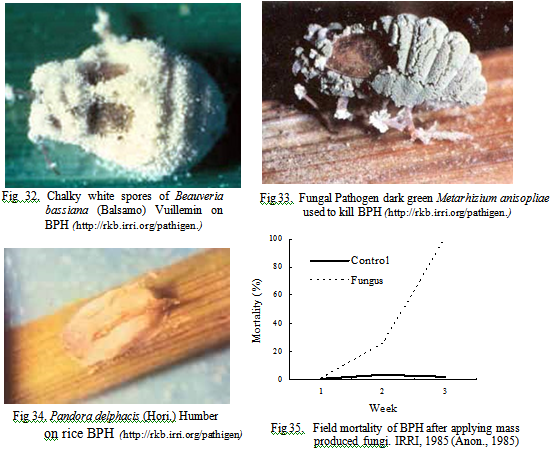 Claridge et al (1999) monitoring the field parasitism of BPH eggs by wasp of the genera Anagrus (Mymaridae) and Oligosita (Fig 7) (Trichogrammatidae) over 6-year period and their technique was to place rice plants previously infested with BPH eggs in the field for 5 days. Their result show that eggs parasitism varied between 18% to 61% in dry and 1% to 65% in wet season (Fig 10) and reduction in BPH survival as a result of eggs parasitism varied between 29 to 91% (Fig 11) (Claridge et al., 1999). Incidence pattern of BPH egg parasitoid and their role in parasitization during different time of the year were observed at BRRI farm, Gazipur, Bangladesh. Ten parasitoid species belonging to four genera Anagrus sp, Oligosita sp, Gonatocerus sp and Paracentrobia spp were found. The parasitism rate ranged from 1.21 – 75.0 % during the study period. The parasitism was observed throughout the year but the rate of parasitism was higher in May (55.91%) and November (57.33%) (Fig 13). Low parasitism occurred in the month of June- September (8.8-12.14%) and January- February (4.74-8.59%). Heavy rainfall and low temperature of those months might be the reason for the low parasitism. Parasitism by Anagrus spp was comparatively higher than that caused by Oligosita and Gonatocerus sp (Fig 14). The parasitoids peaked once in April to May and another in October to November keeping pace with BPH population (Anon, 2008). predators sustain life by killing and consuming animals of other species. A complex of predators predate on nymphs and adults of rice leafhoppers and planthoppers. Among them spiders and predatory insects are important. Spider and bug both play an important role in reducing BPH. Later in the cropping season, predatory bugs become the dominant predators, one of these is mirid bug, Cyrtorhinus lividipennis (Fig 15). Cyrtorhinus lividipennis Reuter is widely distributed in Southeast Asia, Australia, and the Pacific Islands. It preys on the eggs, nymphs, and adults of rice leafhoppers and planthoppers and has been considered an effective predator of the BPH (Heong et al., 1991). Shepard et al (1987) studied the functional response of by Cyrtorhinus lividipennis against BPH eggs. They observed that females had higher daily and total consumption of BPH eggs than males. Egg consumption by both females and males was highest one day after the mired emerged. Nymph or adult mirids can kill the BPH at every developmental stage. One adult mirid usually preyed on 1 to 20 eggs at one feeding. Nymphal mirids consumed fewer eggs. Mortality rate of the BPH was about 73% when equal numbers of third instar mirids and second instar BPH were caged for 24 hours. In Taiwan, two species of mirids, C. lividipennis and Tytthus sp (Fig 18) attacked BPH and green leafhoppers in paddy fields. T. mundulus was prevalent in May or June while C. lividipennis occurred in October and November. Coccinellid beetles are important members of arthropod communities in paddy fields where they play a valuable role in the biological control of insect pests of rice. The mature grub and adult of lady bird beetle, M. Discolor accepted all stage of BPH but the highest preference was for second and third instars nymphs (Fig 20-22). A M. discolor larva consumed an average of 47.6 third instars BPH, while an adult beetle consumed an average of 112.6 BPH during 30 days after emergence (Begum et al., 2002). Other predators that may be found preying on rice planthoppers in rice fields include Rove beetle – Paederus fuscipes Curtis (Coleoptera: Staphylinidae) (Fg. 17) Ground beetle – Ophionea nigrofasciata (Fig19) water bug- Microvelia douhlasi (Hemiptera:Validae (Fig 16). The mortality of BPH caused by Harmonia adults was 77% for nymphs and 91% for adults by Verania adults was 52% for nymphs and 93% for adults. The picture of predator collected from website http://rkb.irri.org. fluctuations of spiders in rice fields in Korea have been reported to follow an “M” shaped curve during the rice growing period in Korea, rice field spiders generally show two peaks. One is when spiders which have over wintered nearby migrate into the paddy, and the other is when the second generation of the year appears. However, annual fluctuations in numbers of rice field spiders showed several peaks when overwintering periods are included (Fig 28) (Lee and Kim, 2001). It was believed these spiders could play an important role in keeping down BPH populations. The wolf spider, Lycosa pseudoannulata (Fig 23) is probably the most important predator in rice fields in Asia. Spiders are dominant in rice during the first 35 days after transplanting (DAT). in a 14-day period each spider killed an average of 17 BPH nymphs/day. A similar experiment gave an average of 24 nymphs/day in 9 days. It was found in India that Lycosa could kill about 15 to 20 adult BPH/day (Samal and Misra 1975). Sigsgaard and Villareal (1999) studied on functional response (predation rate) of Atypena formosana of BPH and green leaf hopper. They found that Atypena formosana (Fig 24) attacked many of the nymph within 24 hour, with more 2nd insters than 3rd insters being eaten. The best was obtained with a Hollings type equation. Using the random predator model, Heong and Rubia (1989) also found a higher response of adult BPH than on adult GLH when the functional response of adult female Pardosa pseudoannulataI (Fig 25), which also primarily searches the lower parts of the stem. In another study to investigate predation on BPH by two spiders species alone, together and in combination with C. lividipennis. .Most BPH were found in control (without predator), least in the treatment with all predators, and intermediate numbers in the treatments with Atypena formosana, Pardosa pseudoannulata and both spider species (Fig 29) (Sigsgaard, 2007). Insecticides killed off both pests and natural enemies and often pests recovered first leading to higher population levels than before, a phenomenon known as resurgence. Hence, in an area in Sekinchan, Malaysia where farmers reportedly treat their fields on a prophylactic basis, a field with three applications of insecticides had fewer predators as compared to fields with hardly any insecticide treatment. Higher ratios of BPH to predators (mainly L. pseudoannulata and C. lividipennis) in sprayed fields suggested that use of insecticides led to higher populations of BPH (Fig 30). The importance of predators in maintaining low populations of BPH was also shown using exclusion cages. It was shown that in the absence of predators, BPH populations reached a very high level. In cages where the bottom was opened to allow predators to enter, both L. pseudoannulata and C. lividipennis helped maintained BPH populations at very low levels (Fig 31) (Ooi, 2005). Survival percentage of BPH was significantly different due to the presence of four predator species at three densities of the predator at 3 and 5 days after release in Bangladesh. Survival of BPH was 100% at all the interval of release in the treatment where no insect predator was released (control). The highest survival (58.88%) of BPH was found after three days of release in the treatment with carabid beetle at a density of 3 and it was lowest (1.66%) with the wolf spider at a density of 7 released against the BPH population density of 20 (Table 2). A similar trend of survival of BPH was observed at 5 days after release of the predator. The highest number of BPH survived at all the day intervals of release when carabid beetle was used, while the lowest survival of BPH was found with the wolf spider. It was found that the population of BPH became almost nil after 5 days of release of wolf spider, mirid bug and lady bird beetle at any density levels of predator and prey (Table 3)( Haque & Islam, 2008). Functional response of the predator showed a significant reduction of the prey when released at different prey population at different time intervals in Bangladesh. On an average, a single Phidippus bengalensis (Fig 26) reduced 92.50% and 74.40% of BPH in 72 hours when released at prey population of 35 and 55 BPH, respectively. Besides, the predator reduces 28.40% and 35.0% of BPH in 24 hours when release was made at prey population of 55 and 35 BPH, correspondingly. In contrast, no change in the BPH population was evident in predator free condition (Table 4) (Rahman et al., 2008). Duck also can control BPH. Preliminary trials to measure the size of duck herd needed to control BPH showed that 10 ducks/70m2 in a 4-h day significantly reduced the pest population (Table 5). At this feeding rate, at least 700 or maybe more than 1,000 ducks/ha would be needed to control in 4 days a pest population of 75 BPH/hill (Anon, 1983). Table 5. Reduction of brown planthopper density by adult ducks herded for 4 h in plots of rice (16 hills/m2) at about 70 days after transplanting. IRRI, wet season. hoppers. Prolonged high moisture is necessary for the germination of fungal spores. The fungus grows into the body of the infected hopper; when the insect is dead, fungus grows out of the body through the joints. 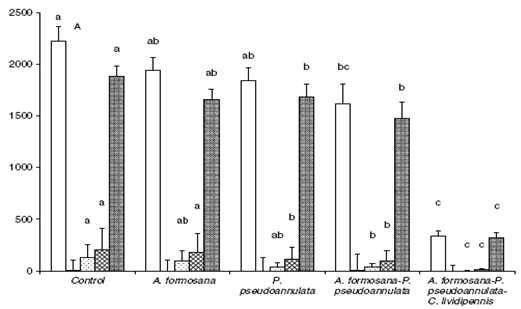 Preparation of several entomopathogenic fungi were tested against BPH in the field, with levels of infection approaching 100% at 3 week after treatment (Fig 35) (Anon, 1985). The fungi Beauveria bassiana and Metarhizium anisopliae were the most promising for further development because of their effectiveness in the field and ease of mass production. Under lab-conditions (light 16 h/d; temperature 25°C, humidity >95%) spore productive strains were tested against N. Iugens. The formulated spore suspensions were able to induce significant mortalities. The entomophthoralean fungus, Pandora delphacis (Hori) Humber is a pathogen frequently causing epizootics of the brown planthopper, Nilaparvata lugens, in rice growing areas of China, India and south Asia (Fig 34) (Melissa and James 1987; Feng et al., 1996; Li, 1984). Two isolates (F95127 and F95129) of the fungus obtained from mycosis-killed planthoppers collected in Zhejiang Province were bioassay for their virulence to N. lugens (Xu et al., 1999). In another study the fungal source collected at local site was more virulent to BPH than exotic ones (Table 6). The most effective concentration of B. bassiana in controlling BPH is 6×1012 spores/ha (Table 7). In field result, li8ke green house the most suitable concentration in controlling BPH is 6×1012 spores ha-1, it could last 14 days after spraying, moreover, yield was not significantly different among treatments due to late spraying of B. bassiana (Table 8) (Nghiep et al., 1999). One mermithid nematode, Agamermis unka also infects hoppers and after death of the insect the nematode emerges from the body. The incidence of nematode parasites is usually low, but relatively higher in the wet season than the dry season. Parasitism of BPH in the lst-3rd, 4th, and 5th instars, and adults was 31.5%, 61.5%, 66.4%, and 45.5%, respectively. Parasitism of BPH by A. unka significantly reduced the number of eggs. Only 4.2% of the parasitized females contained eggs, whereas 85.6% of unparasitized females had eggs. Tilling of rice fields significantly increased mermithid parasitism of BPH. Mermithids parasitized 39.3% of caged adults in the untilled field and 77.8% in the tilled field (Choo and Kaya , 1990). Conservation of natural enemies is concerned for the most part with minimizing harmful effect resulting from the use of insecticides. Such harmful effect can be minimized by careful selection of insecticide and by limiting the dosage and frequently of application. In long term Conservation and encouragement of natural enemies may prove to be the most important of all biological control procedures. 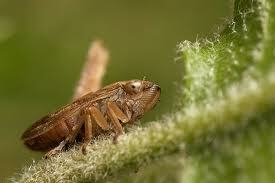 Brown plant hopper is a very serious pest in tropical and subtropical countries of Asia. Several natural enemies have beer recorded against BPH but few can be utilized for pest management as potential predator, parasitoid and pathogen alone or as a component of IPM. The major parasitoids of BPH are Trichogrammatids (Oligosita sp), mymarids (Anagrus sp), and dryinids (Pseudogonatopus and Haplogonatopus sp) wasp and egg parasitism varied between 29-91%. The important predators for BPH management are mirid bug, staphylinids, carabids and different species of spiders. Duck also use to control BPH as biological agent. The important fungal pathogen infect BPH are Metarhizium, Beauveria, Hirsutella, Pandora Spp and one nematode is Agamermis unka A good number of biological control based technology have developed by IRRI, Philippines, indonesia and China and other tropical country. Conservation and encouragement of natural enemies may prove to be the most important for successful biological control.